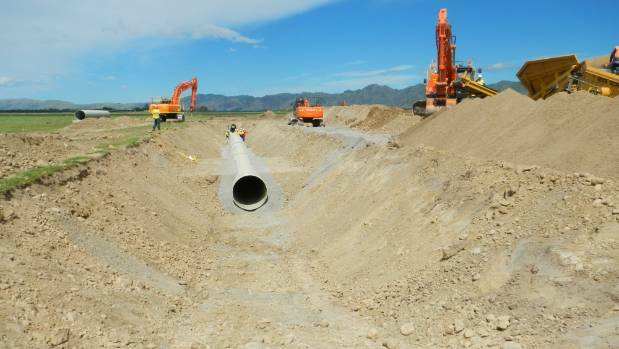 Workers lay new pipes for the Amuri Irrigation Scheme. Farmers in the Amuri Basin are laying the ground work to maximise their most important resource. The Amuri Irrigation Company (AIC) is constructing a new pipe network to improve irrigation practices in the region. “It’s about finding the most efficient use of the resource ” general manager Andrew Barton said. A progress map of the Amuri Irrigation Scheme pipe project. 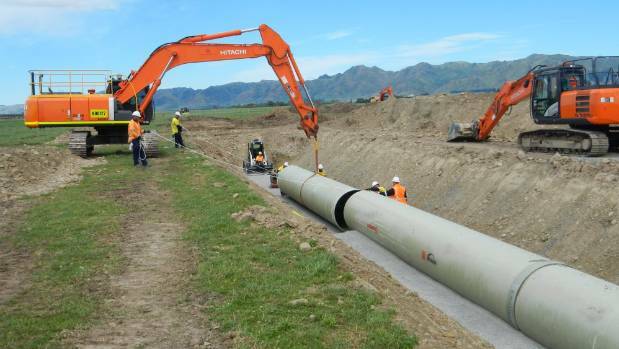 The new network includes 131km of pipe that replaces 106km of open water races to significantly reduce water losses. AIC estimated shareholders lost around 30 per cent of the water from the races which led to the decision to invest in upgrading to a pipe scheme. The Amuri Irrigation Scheme pipe project is on track to be completed in September. 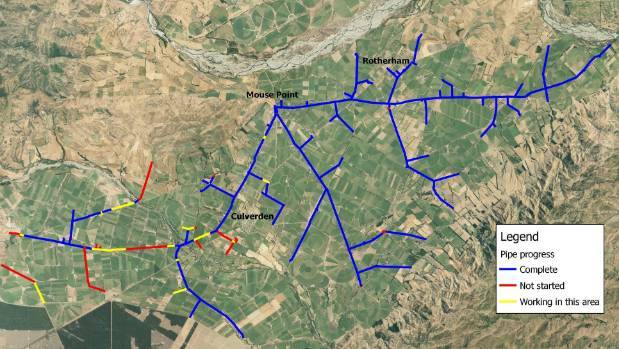 Barton said the network will allow for improved water management through greater utilisation of AIC’s full allocation of consented water, allowing for scheme growth, accurate water allocation and recording. AIC are still taking the same amount of water under their consent but, due to the efficiency, will service an extra 4,700 hectares, bringing the total area supplied by the new network to 27,000ha. Further water reduction has been achieved on farm with over 15,000ha already converted from borderdyke irrigation to more efficient spray irrigation over the past ten years. As the water is also delivered to farms under pressure, the investment costs will be offset in power saving. AIC was formed in 1990 and the Government agreed to sell the three Amuri schemes (Waiau, Balmoral and Waiareka) to the company for $580,000 in the same year. In February 2016, the majority (95%) of existing shareholders voted to proceed with a pipe upgrade for the Waiau and Balmoral schemes. The total budget for upgrading to a piped scheme is $85M, with a $60M pipe contract awarded to Monadelphous for pipe supply and installation. The 12-month project started in September 2016 and is still scheduled for completion in September. Associated works including booster pumping, ponds, canals, pipe extensions and other costs are not covered by the initial Monadelphous contract. “The project got behind initially, but May was a big month of laying a lot of pipe to get back on track,” Barton said. 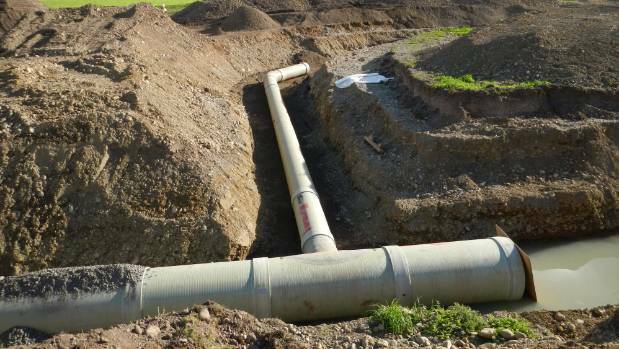 Extra capacity has been also installed into the pipe for potential future hydro-electric power generation. “When we are not irrigating we can use the water moving through the pipes for power generation. With low demand for irrigation in winter, when power demand is at its peak, Barton said it made sense. The scheme also boasts some strategically located hydrants to supply water for firefighting purposes.